A synthetic rubber is any artificial elastomer. These are mainly polymers synthesized from petroleum byproducts. About fifteen billion kilograms (thirty-three billion pounds) of rubbers are produced annually, and of that amount two thirds are synthetic. Global revenues generated with synthetic rubbers are likely to rise to approximately US$56 billion in 2020. Synthetic rubber, like natural rubber, has uses in the automotive industry for tires, door and window profiles, hoses, belts, matting, and flooring. The expanded use of bicycles, and particularly their pneumatic tires, starting in the 1890s, created increased demand for rubber. In 1909, a team headed by Fritz Hofmann, working at the Bayer laboratory in Elberfeld, Germany, succeeded in polymerizing isoprene, the first synthetic rubber. The first rubber polymer synthesized from butadiene was created in 1910 by the Russian scientist Sergei Vasiljevich Lebedev. This form of synthetic rubber provided the basis for the first large-scale commercial production by the tsarist empire, which occurred during World War I as a result of shortages of natural rubber. This early form of synthetic rubber was again replaced with natural rubber after the war ended, but investigations of synthetic rubber continued. Russian American Ivan Ostromislensky who moved to New York in 1922 did significant early research on synthetic rubber and a couple of monomers in the early 20th century. Political problems that resulted from great fluctuations in the cost of natural rubber led to the enactment of the Stevenson Act in 1921. This act essentially created a cartel which supported rubber prices by regulating production, but insufficient supply, especially due to wartime shortages, also led to a search for alternative forms of synthetic rubber. By 1925 the price of natural rubber had increased to the point that many companies were exploring methods of producing synthetic rubber to compete with natural rubber. In the United States, the investigation focused on different materials than in Europe, building on the early laboratory work of Fr Julius Nieuwland, a professor of chemistry at the University of Notre Dame, who developed the synthesis of neoprene. Studies published in 1930 written independently by Lebedev, the American Wallace Carothers and the German scientist Hermann Staudinger led in 1931 to one of the first successful synthetic rubbers, known as neoprene, which was developed at DuPont under the direction of E. K. Bolton. Neoprene is highly resistant to heat and chemicals such as oil and gasoline, and is used in fuel hoses and as an insulating material in machinery. The company Thiokol applied their name to a competing type of rubber based on ethylene dichloride, which was commercially available in 1930. The first rubber plant in Europe SK-1 (from Russian "Synthetic Kauchuk", Russian: СК-1) was established (Russia) by Sergei Lebedev in Yaroslavl under Joseph Stalin's first five-year plan on July 7, 1932. In 1935, German chemists synthesized the first of a series of synthetic rubbers known as Buna rubbers. These were copolymers, meaning the polymers were made up from two monomers in alternating sequence. Other brands included Koroseal, which Waldo Semon developed in 1935, and Sovprene, which Russian researchers created in 1940. B. F. Goodrich Company scientist Waldo Semon developed a new and cheaper version of synthetic rubber known as Ameripol in 1940. Ameripol made synthetic rubber production much more cost effective, helping to meet the United States' needs during World War II. 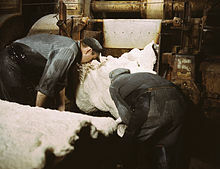 The production of synthetic rubber in the United States expanded greatly during World War II, since the Axis powers controlled nearly all the world's limited supplies of natural rubber by mid-1942. Military trucks needed rubber for tires, and rubber was used in almost every other war machine. The U.S. government launched a major (and largely secret) effort to improve synthetic rubber production. A large team of chemists from many institutions were involved, including Calvin Souther Fuller of Bell Labs. 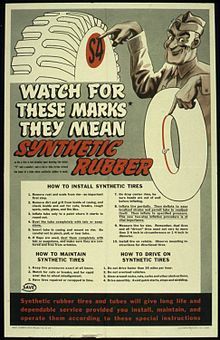 The rubber designated GRS (Government Rubber Styrene), a copolymer of butadiene and styrene, was the basis for U.S. synthetic rubber production during World War II. By 1944, a total of 50 factories were manufacturing it, pouring out a volume of the material twice that of the world's natural rubber production before the beginning of the war. It still represents about half of total world production. Operation Pointblank bombing targets of Nazi Germany included the Schkopau (50,000 tons/yr) plant and the Hüls synthetic rubber plant near Recklinghausen (30,000, 17%), and the Kölnische Gummifäden Fabrik tire and tube plant at Deutz on the east bank of the Rhine. The Ferrara, Italy, synthetic rubber factory (near a river bridge) was bombed August 23, 1944. Three other synthetic rubber facilities were at Ludwigshafen/Oppau (15,000), Hanover/Limmer (reclamation, 20,000), and Leverkusen (5,000). A synthetic rubber plant at Oświęcim, in Nazi-occupied Poland, was under construction on March 5, 1944 operated by IG Farben and supplied with slave labor, by the SS, from the associated camp Auschwitz III (Monowitz). Solid-fuel rockets during World War II used nitrocellulose for propellants, but it was impractical and dangerous to make such rockets very large. During the war, California Institute of Technology (Caltech) researchers came up with a new solid fuel based on asphalt mixed with an oxidizer (such as potassium or ammonium perchlorate), and aluminium powder. This new solid fuel burned more slowly and evenly than nitrocellulose, and was much less dangerous to store and use, but it tended to slowly flow out of the rocket in storage and the rockets using it had to be stockpiled nose down. After the war, Caltech researchers began to investigate the use of synthetic rubbers to replace asphalt in their solid fuel rocket motors. By the mid-1950s, large missiles were being built using solid fuels based on synthetic rubber, mixed with ammonium perchlorate and high proportions of aluminium powder. Such solid fuels could be cast into large, uniform blocks that had no cracks or other defects that would cause non-uniform burning. Ultimately, all large solid-fuel military rockets and missiles would use synthetic-rubber-based solid fuels, and they would also play a significant part in the civilian space effort. Additional refinements to the process of creating synthetic rubber continued after the war. The chemical synthesis of isoprene accelerated the reduced need for natural rubber, and the peacetime quantity of synthetic rubber exceeded the production of natural rubber by the early 1960s. Synthetic rubber is used a great deal in printing on textiles, in which case it is called rubber paste. In most cases titanium dioxide is used with copolymerization and volatile matter in producing such synthetic rubber for textile use. Moreover, this kind of preparation can be considered to be the pigment preparation based on titanium dioxide. By the 1960s, most chewing gum companies had switched from using chicle to butadiene-based synthetic rubber which was cheaper to manufacture. Chemical structure of cis-polyisoprene, the main constituent of natural rubber. Synthetic cis-polyisoprene and natural cis-polyisoprene are derived from different precursors by different chemical pathways. Synthetic rubber, like other polymers, is made from various petroleum-based monomers. The most prevalent synthetic rubbers are styrene-butadiene rubbers (SBR) derived from the copolymerization of styrene and 1,3-butadiene. Other synthetic rubbers are prepared from isoprene (2-methyl-1,3-butadiene), chloroprene (2-chloro-1,3-butadiene), and isobutylene (methylpropene) with a small percentage of isoprene for cross-linking. These and other monomers can be mixed in various proportions to be copolymerized to produce products with a range of physical, mechanical, and chemical properties. The monomers can be produced pure, and the addition of impurities or additives can be controlled by design to give optimal properties. Polymerization of pure monomers can be better controlled to give a desired proportion of cis and trans double bonds. ^ Michalovic, Mark (2000). "Destination Germany: A Poor Substitute". The Story of Rubber. ^ Edwards, Douglas C. (2001). "Chap. 5 – Liquid Rubber". In Bhowmick, Anil K.; Stephens, Howard. Handbook of Elastomers, Second Edition (First ed.). Marcel Dekker Inc. p. 135. ISBN 0-8247-0383-9. Retrieved 8 February 2015. ^ Steinbacher, Sybille (2005). Auschwitz: a history. Translated by Whiteside, Shaun (1st Ecco ed.). New York: Ecco. pp. 45ff. ISBN 978-0060825812. ^ Herbert, Vernon; Bisio, Attilio (December 11, 1985). Synthetic Rubber: A Project That Had to Succeed. Contributions in Economics and Economic History. Greenwood Press. p. 32ff. ISBN 978-0313246340.